The 2015 Aussie Millions Poker Championship Main Event began with 648 runners, but today the final seven returned to the Exhibition Hall at Crown Melbourne to battle down to a champion. Like the Australia Open match between Andy Murray and Novak Djokovic being played across town, there were many ups and downs, but in the end it was hometown hero Manny Stavropoulos who took home AU$1,385,500 and a shiny gold bracelet. 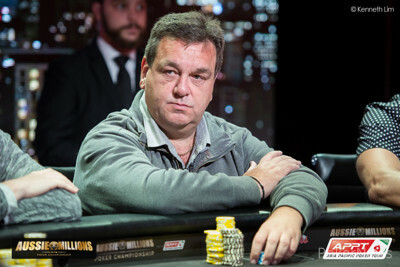 The first elimination of the day came in Level 29 (40,000/80,000/10,000) when Richard "nutsinho" Lyndaker got his stack all in holding the and was up against the of German Lennart Uphoff. The flop delivered Uphoff a set, and the bad beat ended up sending Lyndaker home in sixth for AU$160,000. One level later, Anthony Legg was crippled after losing a big flip to Joel Douaglin, and then a short time later he shoved his last 575,000 all in under the gun holding the and was called by the of Douaglin. The flop left Legg in need of a miracle, but any chance of that happening went out the door when the turn left him drawing dead. The next player to go was two-time World Series of Poker bracelet winner Brian Rast, who began the day as the short stack. In Level 31 (60,000/120,000/20,000), Rast opened for 240,000 from the button and Uphoff called from the big blind to see a flop of . Uphoff check-called a bet of 295,000 and then checked the turn. Rast shoved all in and Uphoff snap-called with the , which was ahead of his opponent's . Rast needed a spade on the river, but it wasn't in the cards as the blanked. Rast took home AU$315,000 for his fifth-place finish. After dinner, James Rann fell when his failed to overcome the of Uphoff in an all-in preflop situation, and then Douaglin busted when he got his stack of 2.105 million all in on a flop holding the only to run into the of Uphoff. Neither the turn nor river helped Douaglin, and he finished in third place for AU$630,000. Uphoff began heads-up play with a nearly 2-1 chip lead over Stavropoulos, who had played a snug game up to that point. 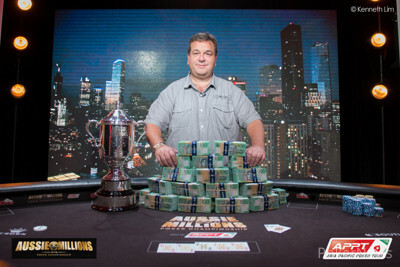 Before long, Stavropoulos, a well-known player at Crown Melbourne often found at the $5/$10 no-limit hold'em cash game tables, was able to assume the lead, and it was at that point the two agreed to a deal. Stavropoulos locked up AU$1,285,000, Uphoff AU$1,214,500, and AU$100,000 was left on the table to along with the gold bracelet. The two jostled back and forth for a bit, but eventually Stavropoulos pulled out to a chip lead before finishing the job in Level 33 (100,000/200,000) in a straight-over-straight hand. 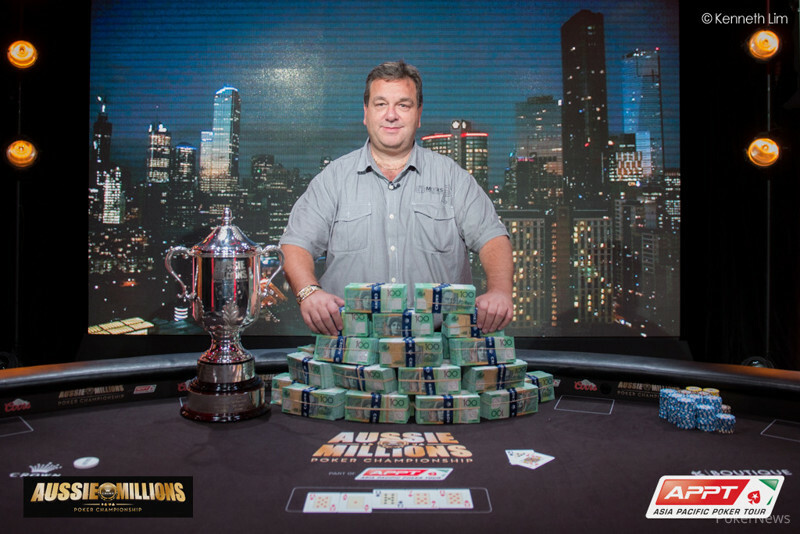 Uphoff finished as runner-up for AU$1,214,500, while Stavropoulos earned AU$1,385,500 and the title of Aussie Millions champions. As Stavropoulos' supporters, of which there were many, cheered after the win: "Aussie, Aussie, Aussie. Oi! Oi! Oi!" That does it for PokerNews' live coverage from the Aussie Millions Main Event, but our Live Reporting Team will return on Monday at 2:30 p.m. local time for the conclusion of the AU$250,000 Challenge, which you can follow in our live blog. In what would be the last hand of the tournament, 20-year-old Lennart Uphoff limped from the button and Manny Stavropoulos checked his option from the big blind. Stavropoulos then check-called a bet of 250,000 on the flop, which led to the on the turn. Stavropoulos led out for 650,000, Uphoff called, and the completed the board on the river. Stavropoulos bet again, this time 850,000, and Uphoff announced that he was all in for what looked like 2 million more. Stavropoulos called with the for a jack-high straight, which bested the ten-high straight of Uphoff. The German finishes as runner-up of the 2015 Aussie Millions Poker Championship Main Event, but thanks to the heads-up deal he'll take home AU$1,214,500. It's not over yet as Lennart Uphoff has doubled up through Manny Stavropoulos. Stavropoulos raised from the button and Uphoff called to see a flop. Both players checked to turn where Uphoff led for 400,000. Call. The river was the and Uphoff wasted little time in moving all in for 1.375million. Stavropoulos called with but was tripped up by Uphoff's . Manny Stavropoulos raised to 450,000, Lennart Uphoff called, and the flop came down . Uphoff check-called a bet of 600,000, and then both players checked the turn. Uphoff checked for a third time on the river and Stavropoulos bet 600,000. Uphoff thought long and hard before making the call, but mucked when Stavropoulos tabled the for two pair. Lennart Uphoff's stack dropped to four million after he turned a missed flush draw into a river bluff but was picked off by a great Manny Stavropoulos call. Uphoff raised to 600,000 on the button and was called en route to a flop. Both players checked to the turn where Stavropoulos led for 800,000. He was called and checked over the river to Uphoff who bet 1.95million. Stavropoulos called with and scooped as Uphoff opened . 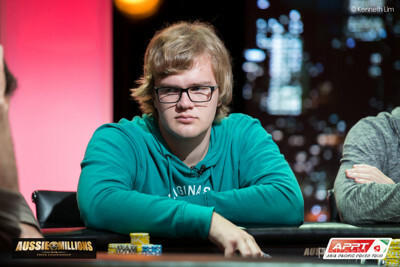 Lennart Uphoff raised to 500,000 on the button and Manny Stavropoulos called to see a flop of . Stavropoulos check-called a bet of 500,000 and then both players checked the turn. Stavropoulos checked for a third time on the river and then folded to a bet of 1.35 million from his German foe. Manny Stavropoulos raised to 450,000 and bet 550,000 on a flop. Lennart Uphoff called both times before the turn and river were checked down. Stavropoulos opened and Uphoff mucked. Manny Stavropoulos raised to 450,000 from the button and Lennart Uphoff called to see a flop of , which they both checked. After the dealer burned and turned the , Uphoff led out for 450,000, Stavropoulos called, and the completed the board on the river. Uphoff bet again, this time 1.35 million, and Stavropoulos called. Uphoff tabled the for trips, and Stavropoulos mucked. Manny Stavropoulos made a flush on the river and managed to get a call out of Lennart Uphoff. Uphoff called from the button and Stavropoulos checked to head to a flop where both players checked. Stavropoulos led out for 200,000 on the turn and Uphoff called. He called another 355,000 on the river and Uphoff called again but mucked upon seeing Stavropoulos' .